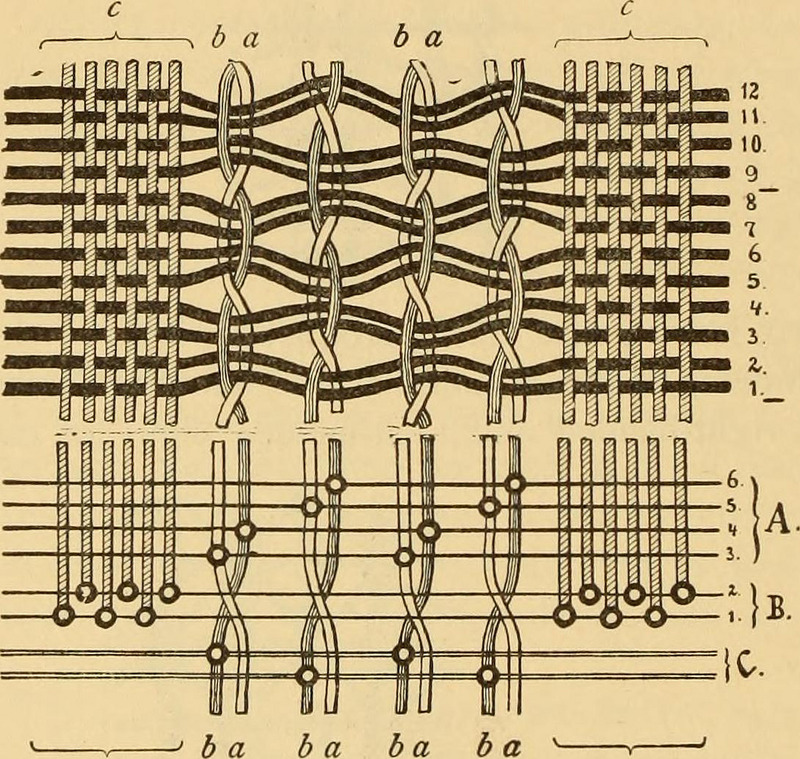 Image from “Technology of textile design. 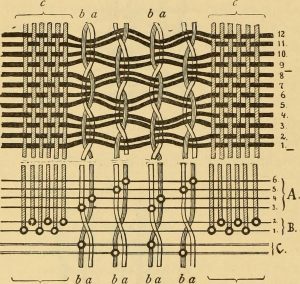 Being a practical treatise on the construction and application of weaves for all textile fabrics, with minute reference to the latest inventions for weaving” by E.A. Posselt (1899) is in the public domain. Courtesy of the Internet Archive via Flickr. I recently finished writing my narrative statement for my second year tenure review file. It felt like pulling teeth. The statement required me to weave together the aspects of my work as well as my research and service to tell a meaningful personal story about my professional purpose and goals. The other sections of the file–the description of accomplishments, presentations and publications, committee work, etc.–were a piece of cake by comparison. I’m not sure why the statement felt quite so difficult, but, boy, did it ever. All my teeth-gnashing about my narrative statement made me think about a program I developed with colleagues this semester, a series of panel discussions that we called “From Concept to Creation: Uncovering the Making of Scholarly and Creative Accomplishments.” We developed this program in order to celebrate the work of our faculty and staff. Even more importantly, though, the idea for this series grew out of a desire to share stories within our campus community about how we engage in research and creative work. We wanted to host conversations about process, not just product. In sharing a behind-the-scenes look at their work, we were hoping panelists would reveal their steps and stages, but also the information literacy and digital literacy skills, habits, and attitudes that were important to each project. I was excited about the potential of this panel series because I think uncovering process is not just interesting, but empowering. And by increasing the transparency of their component parts, we hoped these kinds of research experiences might feel more approachable to our students. In conversations with panelists as we prepared for the series, we offered guiding questions they might consider as they prepared their remarks like the following: How did you take your first steps?, How did you ask questions?, How did you identify a path for your research?, How did you engage with other scholars’ work on the topic to develop your own?, How did your work change course during the process?, What attitudes were important to your process?, What skills and tools were key to your process?, How did you gather/organize/analyze data?, How did you draw conclusions?, and What did you learn along the way?. I had imagined panelists would likely select a particular publication or project and discuss some aspects of its development. Instead, most chose to talk about their undergraduate experiences and their entry into graduate work or their field. Panelists described choices they made, challenges they encountered, and how their paths changed over time. Embedded in each of their stories, too, were practices and perspectives related to information literacy that seemed to me to have been crucial to their process. What strikes me most now, though, is how each panelist interpreted the program theme and the guiding questions and how they chose to tell the story of their work. When my collaborator and I asked our colleagues to talk about their research processes, I didn’t give much thought to how personal their stories might be. As I reflect on the difficulty I felt in drafting my narrative statement, I’m thinking about the balance I, too, was trying to strike. I’m thinking now about how we weave together process and purpose, personal and professional to help focus and understand our work. Midterm brings its share of bustle to the library with last minute research questions to ask and copiers and printers to locate. Library staff are also busy negotiating licenses, finalizing renewals, and troubleshooting access to the resources on which faculty and students rely. I’d like to shed some light on a subtler side of the troubleshooting task that, while not a frequent occurrence, is a growing concern for me as a librarian and researcher. The technologies that enable this bustle of research activity can at times inadvertently trigger what publishers call excessive use or excessive downloading. This is considered a breach of contract according to the licenses for these resources. Remedying this breach usually involves working with university IT security to identify, inform, and prevent such use, assuring publishers that the breach is cured, and publishers then unblocking the network IP or IP range necessary to restore access to content. Recently, I’ve been contemplating researchers’ expectations when working with scholarly content and technology. What technologies are they using? Are they compatible across content provider platforms? How might they trigger excessive use breaches? What exactly is excessive use or excessive downloading in an online research environment? Sometimes the publisher’s license language specifies the use of bots, link-checker, crawlers, spiders, automated software, and even indexing as excessive or unauthorized. But more often, breaches associated with this activity are not explicitly defined, nor are they put in context of excessive use within the license. This leaves it fairly open to interpretation. Publishers must consider the perspective of copyright holders, and typically enforce equivalent limitations for online use that they would for physical print materials uses. It sounds reasonable, but because in reality we use print and online resources very differently, such licenses terms may give up fair use and other scholarly exceptions granted by copyright law. Publishers take an even heavier hand when responding to excessive use breaches. Blocking the user’s IP access, or sometimes an entire campus IP range, presumes malicious intent (which it almost never is). This response also exaggerates the stakes involved and misunderstands what is necessary to perform digital research. Strict reinterpretation of print use restrictions in the online environment denies advances in research technology, from basic citation management software to APIs used for text and data mining. It also ignores the very structure of the linked-data world we live in. When users learn that their actions violate library license agreements, their reactions are surprised, apologetic, and most often confused. While some may be aware of the technologies that makes excessive downloading possible, most don’t believe they constitute unethical or unlawful actions. Breach of contract itself is kind of a boogey-man phrase that brings more readily to mind data breaches like Equifax. If people are aware of breaches occurring in academia, attention more often goes to those involving individual student records. According to one IT security expert I asked, the kinds of scholarly content breaches I’m talking about don’t even register on the scale of data sensitivity or security. Unless credentials were stolen in order to download excessively, it is not security issue; it’s a copyright issue. Publishers who treat copyright infringement as a security issue might be mitigating risk, but they are not serving or educating their customer. Librarians, naturally, do approach this from the service and education mindset. Increasingly that means a not just serving end-users within the academy, but the general public who pay for the research through their tax dollars. As researchers assert the right to retain copyright of their own content and share it more widely, more diverse collaboration is possible, increasing potential for innovative research discoveries. 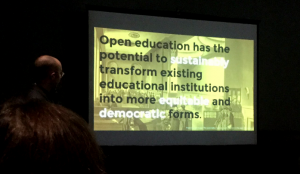 Libraries assert copyright exceptions and expose inequities in traditional publishing structures in order to make openness for innovation possible as well. I’ll digress briefly to the story of Aaron Swartz for illustration and comparison. He was an advocate of openness, yet his deliberate action to hack and release scholarly content provides, I suppose, a perfect case for publishers’ insistence to treat copyright as a security issue. In this case, the breach involved 4 million documents. The scope in numbers (less than 3% of the Equifax breach) pales by comparison, especially considering nature of the data and the consequences (or lack of) to those responsible and to those harmed. Rarely are scholars’ actions as deliberate or the stakes of intellectual property loss as high as this scholarly breach (or breaches of individuals’ personal data). In fact many legitimate uses of scholarly research technologies are being blocked even to those with “rights” to use them. Some examples of technology uses I’ve seen publishers block include citation management software like EndNote that indexes and stores full text where available. As early as 2006, librarians reported browser technologies that link and open an articles’ cited references, triggering such use. What about mining text and data to discover disciplinary concepts across time and from journal publications that span multiple publishers? Innovating digital researchers are developing their own programming for this, but can they use it? Are there alternatives, and are they open or proprietary? My role as an acquisitions librarian means I must balance the needs of publishers supplying the content we license with needs of users who access that content for their research and study. That balance falls somewhere between stoic realism and OAnarchy for me. But I’m still a teacher at heart, so educating all sides remains my goal. In the traditional, profit-based publishing system, where flat library budgets mean buying power decreases each year, I must follow open access developments carefully, just as I must work to negotiate the best deal within these existing structures. There is always room in this to educate publishers, librarians, and users. technologies are your researchers using? This semester I’m on sabbatical from the library. At my university librarians are faculty and eligible for research leaves, and I’m grateful to have been granted one for the spring and early summer. I’m using the time to work on a few writing projects with collaborators and I’ve also started a new research project. I’ll be interviewing students at my urban, public, commuter university on their practices around their course reading, hoping to learn about the ways they get access to their course materials and fit reading into their schedules. So far it’s been fascinating to speak with students about their reading, and I’m looking forward to analyzing the interview data as well. While I knew that the routine of sabbatical would be different than my usual library director routine, I’ve been a bit surprised at how different it is. My usual schedule in the library is heavy on meetings; on sabbatical most of my meetings are with…myself. (Full disclosure: also sometimes with my cats.) I haven’t had this much autonomy over my own time since graduate school and it’s taken a bit of getting used to. The first couple of weeks were odd — I hadn’t realized how much I relied on the predictability of my usual schedule to frame my days. Now that I’m in the interview stage of my project I have a bit less flexibility, and I’m getting more settled into my new routines. It’s been interesting to work on library (and higher ed)-related research and writing full-time while not physically working in the library (or at the college). Most of my research interests focus on practice, and the distinction between my own library practice and research is not usually as separate as it as been this semester. I’m still not quite sure how I feel about that. I appreciate the uninterrupted time for reading and writing and thinking, but it feels somewhat strange not to be in the library at all. Once my student interviews finish I’ll be buckling down for transcription, analysis, and writing, and continuing work on my other projects too. My plan is to schedule worksessions in libraries around the city, public libraries as well as those at the colleges in my university. In addition to the self-imposition of a new routine to structure my days, I’m also looking forward to the opportunities to visit lots of different libraries and to experience them the way patrons do. I’m curious to hear from other librarians who’ve taken sabbatical leaves. How’d it go? What did you find surprising (or frustrating)? Drop me a line in the comments.